Indoor plants are always in fashion. In many ways, they offer the best of both worlds: the joys of gardening, without most of the hard work. As such, the question isn’t ‘should I get an indoor plant?’, but rather, ‘what are the best indoor plants for me?’ Luckily, there are awesome indoor plants to suit almost anyone’s needs. That’s why we’ve compiled this list of 11 of the best indoor plants. Not only are indoor plants a great way to inject some extra greenery into your home, but they can also brighten up almost any room and provide cleaner, fresher air. 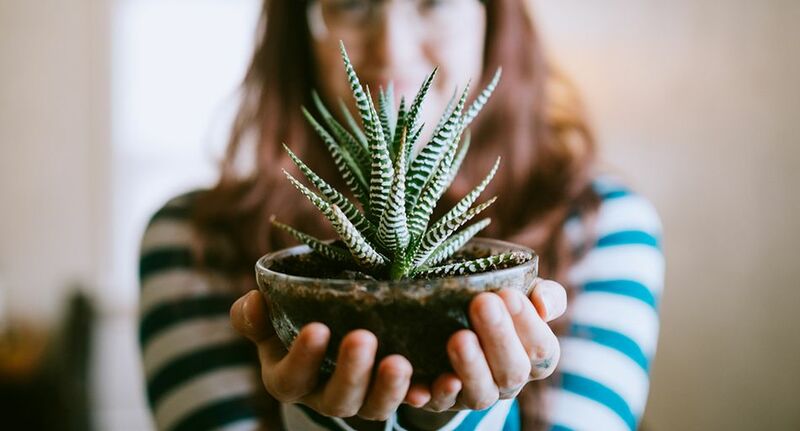 So, whether you’re looking for a plant that’s almost indestructible and super low-maintenance, something that thrives on lots of sunlight, or even something a little more extravagant to add an extra je ne sais quoi to your home, we’ve got you covered! For other inspiring ways to spice up your living space, check out our city-inspired interior design tips, as well as our natural interior design trends. If the name alone didn’t convince you, one look at the so-called ‘Swiss cheese plant’ will surely seal the deal. Highlighted by its broad, green leaves which feature distinctive patterns (hence the comparison to Swiss cheese), the Monstera Deliciosa will be an eye-catching addition to your home. As the name suggests, the Monstera Deliciosa is a feast for the eyes! Monstera Deliciosa should be positioned in a warm room away from direct sunlight, and watered whenever the top few centimetres of soil are dry (approximately once per week). Note that the Monstera Deliciosa is mildly toxic if ingested by either humans or pets, so if you have young children or pets that like to chew on everything in sight, this might not be the best indoor plant for you. Put simply, the Peace Lily is a little piece of perfection. Promoting a serene, relaxing atmosphere, Peace Lilies produce beautiful white lily flowers to complement their lavish, emerald green leaves. As an added bonus, Peace Lilies also help to remove ammonia from the air, meaning they are one of the best indoor plants for a home office or bedroom. Peace Lilies are a reasonably low-maintenance indoor plant. If necessary, they can survive for a long time without water, although ideally they should be watered approximately twice per week. Additionally, Peace Lilies thrive in low-light areas where they receive indirect, filtered sunlight. Lady luck will always be on your side when you add Lucky Bamboo to your home. Lucky Bamboo is easy to identify as it can grow up to one metre high, and features gorgeous curly stems with rich green leaves. With a little extra care, you can even style the stems on your Lucky Bamboo to grow in distinctive patterns. Good luck finding a better indoor plant than Lucky Bamboo! Lucky Bamboo is unique because it can grow in either water or soil, depending on your preference. Accordingly, Lucky Bamboo is extremely resilient, thriving in low light areas, and requiring only occasional watering. A tall, attractive indoor plant, which is ideal for improving the air quality in your home, the Zanzibar Gem is truly a gem! The Zanzibar Gem is also a slow-growing plant, so what you see is what you get: it’s unlikely the glossy green leaves will overgrow and take over your home. Have you ever worried that you’re secretly the Grim Reaper of plants, since every piece of greenery you touch seems to die? If you’re definitely not a green-thumb, but still want an indoor plant, then the Zanzibar Gem might be for you. In fact, some people consider the Zanzibar Gem to be ‘unkillable’. While this might not be quite true, the Zanzibar Gem is a notoriously hardy plant, which can survive for weeks or even months without water or sunlight. A true indoor classic, it’s hard to go past the Cactus if you’re looking to add a touch of uniqueness to your living space. Equal parts rugged and elegant, there’s heaps to love about Cacti, so don’t be fooled by the prickly exterior. Since Cacti come in a wide variety of styles and aesthetics, they are the perfect indoor plant to complement just about any room in your house! It depends on the type of cactus you purchase, but most Cacti only require watering once per week (longer during the cooler winter months), while they should be placed in a warm room out of direct sunlight. At first glance, you could be forgiven for mistaking the Rubber Plant for real rubber. From afar, the eye-catching, greeny-purple leaves have an unmistakably rubbery texture, which make a compelling statement in any room of the house. Rubber Plants grow to fit whatever pot they’re placed in, making them a versatile option for either large or small rooms. Like real rubber, the Rubber Plant is extremely sturdy. In fact, short of drowning it, the Rubber Plant is nearly indestructible. For optimal care, the Rubber Plant should be placed in a warm room out of direct sunlight, watered sporadically (whenever the soil loses moisture), and pruned occasionally – ideally in Spring. To transform your house into a tropical island paradise, look no further than the Bamboo Palm. Bamboo Palms are one of the larger indoor plants you can buy, so before purchasing one, ensure you have sufficient space for a Bamboo Palm to properly flourish. If so, you’ll be rewarded with wavy palm leaves and an unmistakably tropical aura. Island staycation, here you come! As with most indoor plants, the Bamboo Palm should be kept out of direct sunlight and watered 1-3 times per week. As Bamboo Palms can grow to be fairly large, they may need to be re-potted occasionally. Don’t be fooled by the name: the Weeping Fig stands out like a beacon of joy wherever it is found. The Weeping Fig may be small, but it will inject oodles of striking greenery into your life. Trust us, the Weeping Fig will have you weeping tears of joy! An ideal, low-maintenance option, the Weeping Fig only requires watering every 4-7 days and should be positioned near a window to receive bright but indirect sunlight. Small but sensational, the Snake Plant gets its name from its thick, yellow-green leaves which slither vertically out of the soil. Perfect for any room in the house, the Snake Plant’s understated charm will mesmerise you like a cobra. Watch out: the Snake Plant is coiled and ready to become a permanent fixture in your home! As a type of Succulent, the Snake Plant is very tolerant to under-watering, but can easily be killed by over-watering. So, if in doubt, don’t water! If green isn’t really your colour, but you’re still looking for one of the best indoor plants that money can buy, look no further than the African Violet. As one of the few flowering plants that require little care, African Violets make the perfect indoor plant. Your reward? A striking purple bloom, which is bound to bring out the best in your home. As mentioned, African Violets are one of the few flowering plants that require little care. They should be watered once per week and should receive filtered sunlight to ensure the Violets flower properly. Pothos, also known as Devil’s Ivy, is a gorgeous, fast-growing vine, highlighted by its waxy, heart-shaped leaves. Pothos can be kept in either hanging baskets or as cuttings placed in a glass vase, making it a versatile accessory which can either snake along the ceiling, or add a touch of style to your benchtop. One thing’s for sure: Devil’s Ivy will make a devilishly delightful addition to your home! Pothos are super resilient and low-maintenance, requiring watering every 1-2 weeks, depending on the season. In fact, Pothos prefers its soil to completely dry out between waterings, meaning it will accept a more erratic watering schedule. While Pothos will tolerate low-levels of direct sunlight, it should be kept in indirect light. Pothos also helps to remove toxins such as formaldehyde, carbon monoxide, and benzene from the air. If reading about 11 of the best indoor plants has got your green thumb itching, be sure to check out our overview of the rise of urban garden design, plus 18 plants to grow for a bee-friendly garden!